Following the success of the high-performance (but equally costly) RGM-79SC GM Sniper Custom, the Earth Federation Forces commission a new sniper-use GM to be built during the last weeks of the One Year War. Due to the tight one-month deadline for designing and first rollout, only a handful of the new RGM-79SP GM Sniper II are seen in the last few days of the war, with some assigned aboard the assault carrier Gray Phantom (both of which are destroyed during a battle inside the Side 6 Libot Colony) and the White Dingo team in Australia. 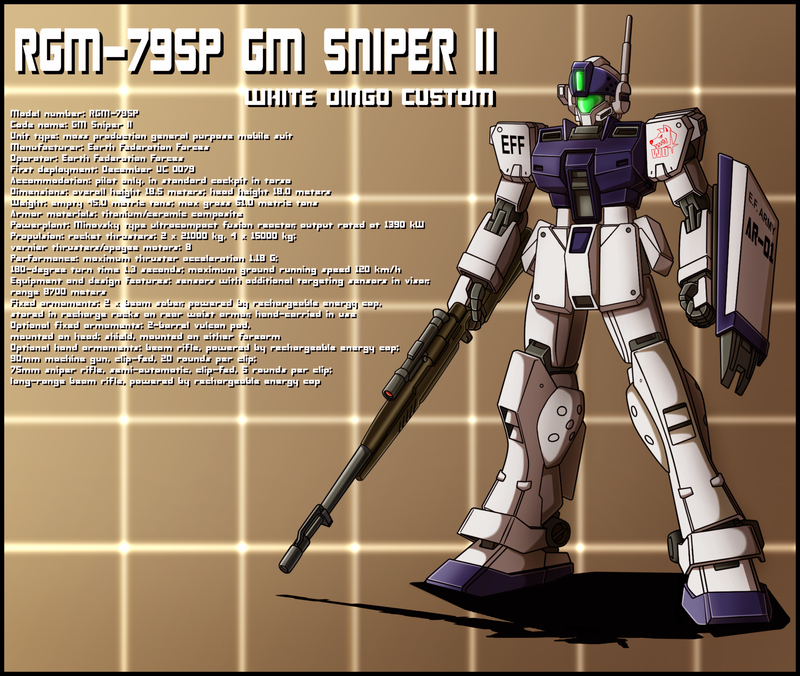 The GM Sniper II is based on the in-development RGM-79G GM Command, and is the most powerful GM variant built during the war. Featuring special targeting sensors in a "face guard" visor for its standard sensors, the GM Sniper II can be equipped with a beam rifle or 90mm machine gun for close-quarters combat, or a long-range, projectile-firing rifle for sniper missions.